As you can tell, I’ve been traveling quite a bit lately, which is why the number of posts on the Beer-and-Burgers blog has slowed considerably. But I really did go to all of those places – and all in the last five weeks. Can you say hectic? I thought you could. Surly Brewing Company (Brooklyn Center, MN) – On a trip to North Dakota, I tasted the Bender and the Coffee Bender in Minnesota (which is just across the river from where I was staying). The Bender is a brown ale made with oatmeal that created a taste similar to a stout. Although it was somewhat dry, I liked the creaminess of the beer, and noticed a little caramel flavor at the end. The Coffee Bender is the sister beer. The addition of coffee to the Bender made it even creamier, making it feel like a coffee stout but with enough caramel sweetness to balance out the bitter coffee flavor. Delicious. Two Beers Brewing (Seattle, WA) – Tried the excellent Sodo Brown Ale during a visit to Seattle in February. Heavy on the malt, this beer had a bit of cocoa flavor that wasn’t overpowering, but enough to make it semi-sweet and exceptionally smooth. 406 Brewing Company (Bozeman, MT) – The Brown Porter is outstanding. It rivals the Pecan Porter from 512 Brewing Co. in Austin, TX. Obviously naming your brewery after the area code where you live means you can make an excellent porter. Lots of caramel flavor and malty goodness to counterbalance the smokiness at the beginning of the taste. Tröegs Brewing Company (Hershey, PA) – The Mad Elf Ale may look like an everyday Amber in the glass, but this Winter ale is the perfect conclusion to anyone’s holiday season. I tasted a hint of chocolate and cherry, but lots of malt from start to finish. At 11% ABV, you probably only need one of these to kick off a celebration. Usually only available through February, so I was lucky to find one during a trip to Scranton, PA in March. Of course, all the travel meant flight delays, missed connections, and plenty of time spent in airports. So there I sat, in the Minneapolis airport for the second time, waiting for the same flight going to the same place leaving from the same gate. And both times, I had a four-hour layover. What to do, what to do? Fortunately, there is a Rock Bottom Brewery in the airport. And even better, it’s right around the corner from the gate where the flight leaves at 8 p.m. for D.C.
Now, I’m not a fan of chain restaurants … nor chain letters or chain link fences, for that matter. (I’m OK with chainmail, if worn correctly.) But I’ve had several good meals and beers at Rock Bottom Brewery in the past. Took some friends to the one in downtown Chicago and had a great time. Used to visit the one in Dallas when it was open. And so I was OK with spending a few hours at Rock Bottom in the Minneapolis airport. The first time, I was able to enjoy the Winter Warmer and the Chocolate Porter. Both were pretty good. The warmer tasted of molasses and nutmeg, while the porter was exactly as advertised – very chocolatey and sweet. The warmer was perfect with my Laredo burger, which featured a little spice in the cheese and toppings, and was cooked a perfect medium rare. The second visit exactly one week later wasn’t quite as good on the beer or burger front. The Warmer was gone, and the Porter didn’t go well with that spicy burger. And I think this time the cook let it sit too long on the grill because there wasn’t any pinkness left in the meat. Still, sitting there wasn’t exactly the worst way to kill four hours waiting for an airplane. So who cares if all I could get was an airporter. If you find yourself hitting Rock Bottom, this is the way to do it. 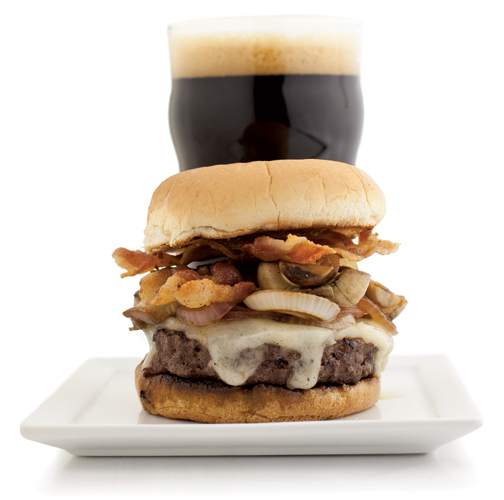 This entry was posted in Beer related, Burger related and tagged beer, burger, burger place, Christmas ales, craft beer, craft breweries.